Baghdad Rocked Again By Deadly Bomb Blasts : The Two-Way About 30 people were killed today and more than 60 wounded, according to authorities, by explosions near two sites where day laborers were gathering to look for construction work. Shiite neighborhoods were targeted. 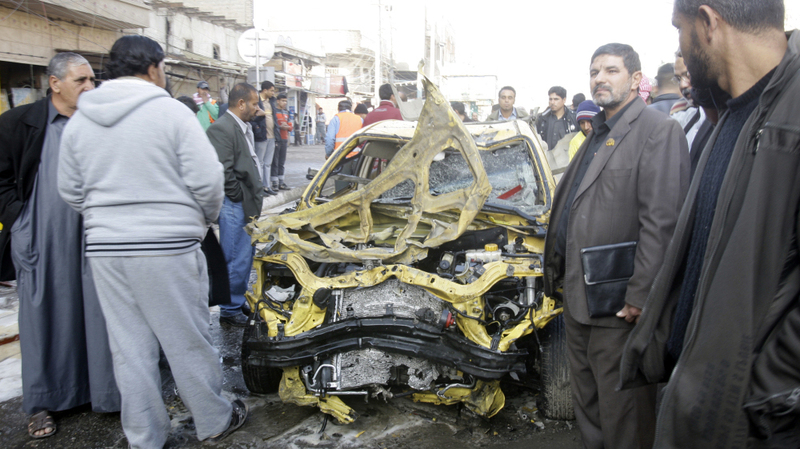 Iraqi men examine some of the wreckage left behind after one of today's explosions in Baghdad. The death toll is rising in Baghdad from another series of deadly bombings apparently aimed at Shiite Muslims. About 30 people were killed today and more than 60 wounded, according to authorities, by explosions near two sites where day laborers were gathering to look for construction work. Iraq's Interior Ministry tells the BBC that the attacks happened in Baghdad's Sadr City and Kadhimiya neighborhoods, both predominantly Shiite. It's the worst day of violence since Dec. 22, when multiple explosions in about 13 different locations in Baghdad killed dozens and wounded more than 200. Those attacks also were predominantly in Shiite Muslim neighborhoods. As al-Jazeera correspondent Dahr Jamail reported from Baghdad, the attacks add to already high tension in Iraq, where Iraq's Shiite-dominated cabinet has issued an arrest warrant for Vice President Tariq al-Hashemi, Iraq's highest-ranking Sunni Muslim politician. "Many Sunnis," The Guardian notes, "have complained of being sidelined in the political process since Saddam Hussein was ousted and the majority Shia dominated the government." The U.S. withdrew the last of its combat forces from Iraq last month, nearly nine years after the start of the Iraq War.